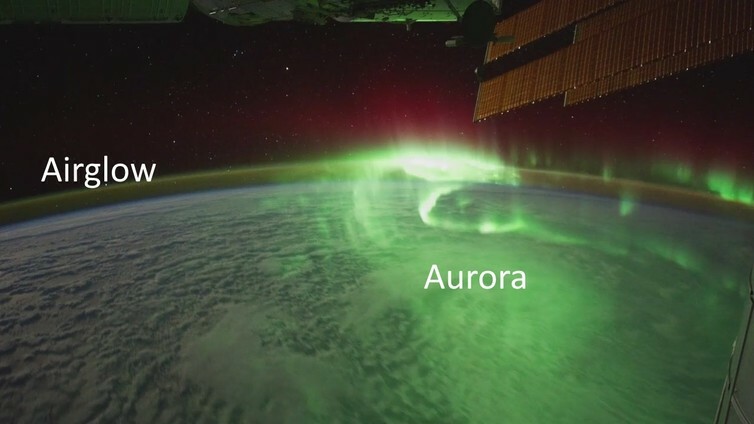 now reading: What's the Difference Between an Airglow and an Aurora? What's the Difference Between an Airglow and an Aurora? Amateur astronomers and aurora hunters alike have been reporting a green glow across the UK sky. Easily confused with the aurora borealis, or northern lights, the sightings were of another phenomena called “airglow”. Airglow is the natural “glowing” of the Earth’s atmosphere. It happens all the time and across the whole globe. There are three types of airglow: dayglow, twilightglow and nightglow. Each is the result of sunlight interacting with the molecules in our atmosphere, but they have their own special way of forming. Dayglow forms when sunlight strikes the daytime atmosphere. Some of the sunlight is absorbed by the molecules in the atmosphere, which gives them excess energy. They become excited. The molecules then release this energy as light, either at the same or slightly lower frequency (colour) as the light they absorbed. This light is much dimmer than daylight, so we can’t see it by eye. Twilight glow is essentially the same as dayglow, but only the upper atmosphere is sunlit. The rest of the atmosphere and the observer on the ground are in darkness. So, unlike day glow, twilightglow is actually visible to us on the ground with the naked eye. The chemistry behind nightglow is different. There is no sunlight shining on the nighttime atmosphere. Instead, a process called “chemiluminescence” is responsible for the glowing atmosphere. Sunlight deposits energy into the atmosphere during the day, some of which is transferred to oxygen molecules (e.g. O₂). This extra energy causes the oxygen molecules to rip apart into individual oxygen atoms. This happens particularly around 100km in altitude. However, atomic oxygen isn’t able to get rid of this excess energy easily and so acts as a “store” of energy for several hours. Eventually the atomic oxygen does manage to “recombine”, once again forming molecular oxygen. The molecular oxygen then releases energy, again in the form of light. Several different colours are produced, including a “bright” green emission. In reality, the green nightglow isn’t particularly bright, it’s just the brightest of all nightglow emissions. 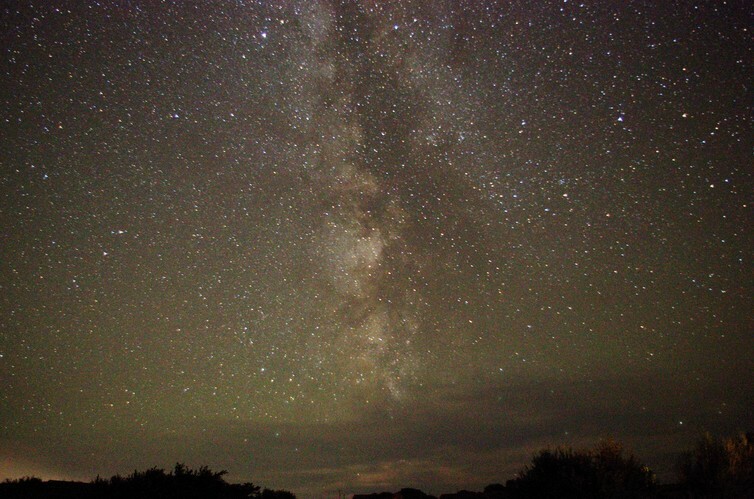 Light pollution and cloudy skies will prevent sightings. If you’re lucky though, you might just be able to see it by eye or capture it on long-exposure photos. The green night glow emission is very similar to the famous green we see in the northern lights. This is unsurprising since it is produced by the same oxygen molecules as the green aurora. But the two phenomena are not related. Aurora form when charged particles, such as electrons, bombard the Earth’s atmosphere. These charged particles, which started off at the sun and were accelerated in the Earth’s magnetosphere, collide with the atmospheric gases. They transfer energy, forcing the gases to emit light. But it isn’t just the process behind them that is different. The aurora form in a ring around the magnetic poles (known as the auroral oval); whereas nightglow is emitted across the whole night sky. The aurora are very structured (due to the Earth’s magnetic field); whereas airglow is generally quite uniform. The extent of the aurora is affected by the strength of the solar wind; whereas airglow happens all the time. Why then did we get a lot sightings from the UK recently, rather than all the time? The brightness of airglow correlates with the level of ultraviolet (UV) light being emitted from the sun – which varies over time. The time of year also seems to have an impact on the strength of airglow. To maximise your chances of spotting airglow, you’ll want to take a long-exposure photograph of a clear, dark, night sky. Airglow can be spotted in any direction that is free of light pollution, at about 10⁰-20⁰ above the horizon.